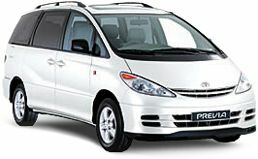 Toyota look to have moved ahead in the space race with their all-new Previa people carrier. The highly versatile Previa boasts a cavernous 166 cu ft interior which puts it right at the top of the multi-purpose vehicle class. The base model 2.4 GS which I tested left me well impressed with the advances in driver enjoyment now bestowed on this type of vehicle. The people carrier is no longer just a van with windows, and while you can forget about any sporting pretensions, the Previa handles reasonably well and offers a cosseting ride to match some of the more established luxury car marques. The second generation Previa even manages to cut quite a dash in the looks department, especially from the front, where it appears quite aggressive looking with its deeply slanted headlamps and black front spoiler. The ''one wave'' styling continues along its flanks and the flat but functional rear end also boasts a wind deflector above the tailgate. At nearly five metres long Previa is a large beast and its sheer bulk takes a bit of getting used to. This means that slotting it into the measly spaces that supermarkets seem to delight in providing isn't the easiest job but the Toyota does have an ace up its sleeve with those big sliding side doors making rear access very simple indeed. Bumper mounted parking aids are also an option. The interior features no less than 18 different storage bins and cubby holes inside so finding a space for your oddments isn't a problem - finding them afterwards might be! The very smooth shifting automatic version, with the gear selector lever sprouting from the dash to free up more floor space, is probably the one to go for and Toyota expect that 70% of Previa owners will choose this option despite a £1500 premium over the manual. Coupled to the whisper quiet 154 bhp 2.4 litre VVT-i petrol engine standard across the range, this combination does a pretty good job of hauling the 1700 kg car about. There is word of a diesel version soon and although it offers more torque I would expect refinement to be compromised. An average of 30 miles per gallon should be possible with the petrol engine which isn't bad for such a large vehicle. The Previa comes with seven or eight seats depending on spec and both rear sets can be folded, shifted or removed in a variety of ways too exhaustive to go into here. Safe to say that it's very versatile indeed. Up front the armchair type seats for driver and co-pilot and centrally mounted dash give a commanding view of the road ahead, the cabin has a bright airy feel thanks to those huge windows and build quality is good. Air conditioning, anti-lock brakes and electric windows are standard kit throughout the range. My test car was fitted with Toyota's excellent satellite navigation system which is an £800 extra on the GS and GLS but standard on the range-topping £24,450 CDX. I found this device easy to follow, devastatingly accurate and well worth considering if route-finding ''harmony'' is sometimes a problem!